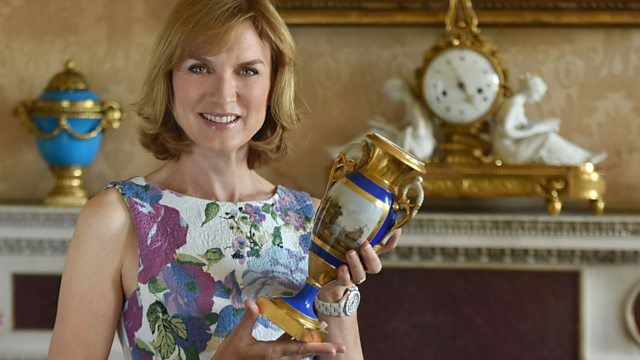 Fiona Bruce introduces unscreened gems from recent shows, including a cross believed to have been gifted by Marie Antoinette en route to the guillotine. close to our most southerly point in the land. And now we're coming to the end of our series. Tonight we've something special in store. even royal relics. It's all to come. Tonight's locations are as diverse as the finds. and Audley End, a Jacobean stately home in Essex. Ightham Mote near Sevenoaks in Kent. Nothing on the bottom. A very simple Chinese-looking cup. clearing it. My husband and I were clearing it out. And I just thought how pretty it was. -You just wanted to hang onto it. Yeah, I don't know anything about it, really. It looks Chinese in the sort of blue-and-white design. But this was made at Worcester. because I know the shape and design quite well. But I've only ever seen one of these before - in many, many years. -I just love the simple shape of it. Chinese porcelain. And they painted it in the blue, in the Chinese way. Here, what I like is the texture of the blue painting. -It's a bit smudgy and blobby. -But it's in little tones of blue. -Is that flow blue or not? right but they didn't really know how to. That goes back to 1751 or '52, right when the factory started up. -So, it's the middle of the 18th century. -And not only old, it's actually pretty rare. But it's got that chip. -It's got another chip there. -But I don't mind that. No, I don't mind it, either. Especially as I've seen only one before. Oh, wow. That's marvellous. Thank you very much. This is really nice. What made you bring this? Well, it was yesterday, actually. I was round my parents' house. My father's a retired bookbinder. in a convent, bookbinding, art and woodcraft. they gave him this as a gift, as a parting gift. The nun said it was from the French persecutions. -This is that old, yeah. And it's got its original polychrome and gilding. you probably think it's distressed. -You've done a very good job. It's got a bit of a value. It's got a decorative value cos it's cute. In auction this would make 200-250, safely. -Fantastic. Oh, Dad will be pleased. -They're a very nice thing. "Tis is my delight, the French to fight." -this is the last thing you want to see pointed at you. The lock is a military lock. -This sort of thing is used for home defence. You bought it. What did you like about it? Well, I liked the inscription, which attracted me. But the whole gun is small and handy and useful, especially up close. The exact definition of a blunderbuss. -This is an 1800 sawn-off shotgun. -You've got a little bit of repair work here. Little bit of repair work there with very nice finials. Lovely. That's marvellous. Absolutely marvellous. It's a fantastic thing and I just love it to bits. haven't you? Tell me all about it. -and had no-one to leave it to. a companion to a Countess von Fersen in Sweden. And when she left her service, the Countess gave her this cross. was a confidant and some say lover of Marie Antoinette. as a memento because she knew she was going to the guillotine. Obviously, I have no proof of any of this. Up until the time it was given to my mum. -So that's why I brought it here today. getting an answer. Because I will give you an answer. And the French Revolution was in 1789. But your cross dates from about 1889. -And so it is, unfortunately, a complete impossibility. -It is a shame. And I'm sorry about that. But these stories abound about the tragic French Queen. -tell me what it's made of. -I think it's garnet diamonds. Almandine garnets. And another irony is, it's almost certainly English. -It's a style that one recognises. or that's an 18th-century house from 1789. And jewellery is like that. It has a sort of signature element to it. So this is an age where religious devotion was absolutely everywhere. And purple stones stand for devotion. an emblematic meaning but it's not the one you thought it was, is it? -I know, I'm disappointed, too. -I would have loved it to have been. It simply can't be. But we'll just look at it as it is. Everybody would want to own it. And so I'm going to say it's worth £700. Oh, right, well, that's a nice surprise. Thank you very much. Do you know, when I saw this it took me straight back to my childhood. All the classic shows. Are you a space nut? -all that type of stuff. Yep. And one of the things was this probe which is Luna 16. And I was going past the market in Moscow and I saw this model there. I knew exactly what it was. So I paid 35 US dollars. -OK. And did you think that was a lot? -bargain because I thought it was a beautiful model. That's the thing. It's just pretty. Cast in aluminium on this lovely Perspex stand. Nicely engraved. -Have you found out what this engraving is? This was to one of the people who was very high up in the politburo. His name was Viktor Vasilyevich Grishin. and the various different probes that went to the moon. some rock samples so this is why they sent up this particular probe. suppliers of parts and instruments. They were presented like this. The higher up it gets up that food chain, the more exciting it becomes. Which is good for this. And I think that easily in auction at the moment, £2,000-£3,000. Wow. OK. Thank you very much. -It's so cool, it's a pleasure. and travel more than 300 miles north. made the perfect setting for our experts and visitors. to very severe and austere black and white here. Both of them different kinds of print. dating from just after the First World War. Does that fit with your family? It does fit with what I know about them, yes. -married to quite a well-off lawyer. -And was self taught in art. And I think they were there for at least six months, if not longer. -In about the '20s, the 1920s. -What a great time to be there. distributed among the family were things like a Chagall painting. And these two came to my mother. -So you didn't get the paintings, you got the prints? -She also got the Vlaminck, but she sold that. But we've got those two. And I've always loved that one. This one by Picasso. This is a very early print, isn't it? copperplate you just make the marks directly on with a sharp point. it often squashes that burr very quickly. and this sort of shading around the horse's head? Well, that goes very quickly. So that suggests that is quite an early one, then? -I think it is quite an early one. Yeah, exactly. Because you can still see that sort of quite strong line. -It hasn't gone ghostly yet. -I've always loved about it. -Yeah, it's a very pretty thing. And early Picasso is really interesting, I think. Anyway, moving from him to this one. This, of course, is a Gauguin. Paul Gauguin is in Tahiti towards the end of his life, isn't he? this, the ink lies on the ridges you've left. So he's cutting away and the ink goes on top of what's left. the trees aren't big enough to make a print this big. -You have to join them all together. Tahitians all sitting round a fire. And I'm afraid I don't know what that means, "Mahna No Varua Ino." -I think it means "The Devil Speaks." -Crikey, that's rather occult, isn't it? -this fireside light, it's very primitive, isn't it? This is a very complicated area. who was dealer to both Picasso and Gauguin. And he's the man who published these. from the very first edition of these prints, so don't get too excited. OK. But this Picasso is from very early on in the second edition. market terms is probably about £2,000 or £3,000. -Which is rather nice, isn't it? Now, the Gauguin is nonetheless fresh for being a bit later. the time your grandmother was in Paris, so that makes perfect sense. The value on this one is a bit more. Not a huge amount more. £3,000-£4,000. just to be in the second or first edition. -You can add a nought. on the wall, and I'd rather have it on the wall. I love that one. It's rather nice, isn't it? Very much Arts and Crafts in feel. You've got all this planishing giving this wonderful surface. with the two children dancing. Absolutely super. It's got the whole feel of the Arts and Crafts. I can always remember it being on the fireplace, on the mantle shelf. She said she wanted her ashes putting in it when she passed away. -Should I open it or...? No, we didn't do that. -In that case, I think it was perhaps a wedding present. Right. That would make perfect sense. -I mean, that's a very joyous object to have as a wedding present. Now, the maker's quite intriguing. And he was working in Otley. Interestingly, he didn't register as a silversmith. -He registered as an artist. he was the lecturer at the local art college. All adds up. All adds up very nicely. from the point of view of silver, going to be worth? But it's such a gorgeous piece. And I think, I could easily see that at auction at about £2,000. Yes. But I shan't be selling it. brought along a family archive relating to his late father. You only first looked at this three days ago? -And it belonged to your father? cos I knew it contained a history from the First World War. Cos your father was a soldier in the First World War? He was Second Lieutenant in the Royal Field Artillery. And he fought at the Somme? He never spoke about it at all. He was in the Second Battle of the Somme, yes. Three days ago when you opened this case? -What else did you find out? -That he'd been a prisoner of war. His trench was overrun after he was wounded. And this picture, is this your father here? This is my father in the local paper. And look, "Young Officer Missing". -He would be just 18, I think. There's other things in here it looks like you haven't opened yet. -These are letters from your father? -Which you have never opened? -Have never opened. I never have. I felt I was intruding onto his space. I haven't opened the letters. But you're welcome to open them. -to be honest with you. -It's obviously hugely emotional for you. -Of course. He's your dad. -So this is just short of 100 years old. -Do you want me to open them? -Let's open one of them, shall we? Right. And that was towards the end of '17. "Dear father and mother, I haven't had a letter yet of any sort. "Still, I expect one will be up soon. "I saw a Fritz plane brought down. It was a fine sight. "as he had a load of bombs on board. "Tell me how long it takes for this letter to get to you. "Have you discovered where I am yet? Will stop now. Love, Barry." Young, young man, writing to his parents. These are Barry's letters from Germany. -So this will have been after he'd been taken prisoner. There we are. That was his number. "to what we're used to in England. "We have no permanent address as yet. "But I have hopes of being settled in a few days more. "The last time my leg was dressed it was done by an English doctor. "The doctor said he thought it might be possible to get an exchange." Exchange prisoners of war, I suppose. I think that's what it means. "Heaps of love, Barry." is probably what saved him. And what made it possible for you to be here. -You've got some reading to do now. There's a whole other pack here for you to start. -for the first time, today. -I know, it's emotional, isn't it? is a poignant example of the lasting impact of World War I.
the end of the conflict. These are such charming chairs. Hepplewhite style. which draws me to them the more I look at them. -How many do you have altogether? -Six in total. Four more like this. Four side chairs and one armchair. -I think it probably would have been a much longer set, originally. I suspect. But just look at the way this is drawn, it's so sweet. And there's one maker in this area that I think of immediately. -Can you think of who I'm thinking of? -Are they Gillows? I don't know. But it's got that lovely early feel about Gillows. Well, they belonged to my father's mother's family. They were sold in 1937. My father knew where they were. And then he had the opportunity to buy them back in 1973. After he died in 1980, my sister bought them from the family. with the agreement of the family. -they turned up in a local auction to me. -You just found them by chance? -I couldn't let them go. -So they were in the family prior to 1937? What date do you think they were made? OK. They are a really nice set, a small set. A short set of genuine Hepplewhite chairs. that I just love them. and very quickly, there are two things. Firstly, look at the way this shield here hangs. A copyist would never have dared do that with that gap. He would have had that sitting on the bottom rail there. -And that, to me, is a wonderful quirky thing to do. especially this popular model, that would have been done by machine. This is handmade. And charming. -a set of 14 originally. So, they were in the family, came out of the family in '37. -You bought them back - how long ago, did you say that was? So, four or five years ago, something like that. the market for this sort of thing is disastrously low. and nobody wants dining chairs. -Dare I ask you how much you paid for them? -What was the estimate on them? Sorry, I have to repeat that, the estimate was £70-£100? -For a set of six dining chairs? ..2,600, 2,500, something like that. I think you've done very well. They are a super set of chairs. -But more important than anything, they're family chairs. I fancy myself as a bit of woodworker. And I've got some quite nice tools. And this just takes the biscuit. What do you know about it? the Great Exhibition and I just thought he was talking nonsense. And he's used it until recently. -And then I saw the head of Albert there. Yes, he has used it, yes. It was in the garage being used to cut up wood. the instigator of the Great Exhibition. One of the great patrons. It was his idea. do I gather White is your family? Yes, that's my dad's mother's family. -They had a factory in Sheffield. And so there's a wonderful direct connection. But the crowning glory of the whole thing is this. -That's what gives it Exhibition status. It's going to be a cast heavy metal with the silver-plated finish. I'll turn that upside down. And turn the saw upside-down. -How do you value such a thing? It's just a tool... No, it isn't. It's a very, very special tool. are both highly collected areas. Really highly collected and special areas of interest. has got to be worth towards £2,000. -It's not for sale. It's staying with me. -It's a very special thing. Antique jewellery, which absolutely gets to the core of my being. These are fantastic pieces for you to bring to show me. Tell me a little bit about them. My family had a jewellery business in London. And completely changed from being jewellery-minded to animal-minded. -So, you swapped the sapphires for the sheep dip? -shop stock or are they personal pieces? that over the years the family have kept back for themselves. with a drop suspended at the bottom. Which is actually costume jewellery. Today, we see hundreds and hundreds of pieces of costume jewellery. necklace was actually made in around about 1740.
different kettle of fish from the more contemporary stuff that we see. can you see it's actually pretty ordinary-looking? It's base metal. You can see the metal content coming through there. But the age of it is significant. was made in around about 1670-1700.
figures and a gold thread monogram. The mount is in gold and it has what's called a pie-crust setting. Almost like a little pie crust that you make going round the edge. And then surrounding the centre is a hoop, if you like, of real pearls. in white, pink and black and that's how I can date it. Let's move forward in time. And this time let's go to this pad here. probably made in around 1870 by Carlo Giuliano. He was the great Goldsmith of the 19th century. He did revivalist jewels. He produced enamels. He was a fantastic craftsman. the original Giuliano fitted case. That is terribly, terribly important and terribly rare. we have this luscious fabulous moonstone necklace. in the way that they are just so rich in their colour. that enclose each of the stones beautifully. This is a great necklace. So, 35-40 years, just kept it there, lying in a drawer. OK. Shall we start with that? The costume necklace, base metal and glass, costume jewellery - £2,500. The little Giuliano pendant is a teeny bit damaged. so let's be careful, let's not go crazy. -And let's say £1,500 for that. -But let's be careful with it. it's incredibly difficult to price. Because that, for me, is one of the best of those slides that I've seen. So it's got to be worth £4,000, hasn't it? Really. So, let's do a quick tot up for you. -Yes, worth more than you thought they'd be worth? We're looking at a butterfly, quite crudely made. And it says, "In memory of summer, 1945. "Made of the rubbish of the ruins of Berlin." Well, how have you got it? He was over in Berlin towards the end of the war. And he brought it home with him. And is that all you know? That's all I know. He was a very private man. He really never spoke about the war or anything. And when I asked him about it, he said, "We don't talk about that." -And that was as much as he would say. -But it was always on the wall? I remember it from being a little girl. Always there. Same place. -So the story's gone with him? -Absolutely, yeah, which is sad. -We have to assume he bought it. -I mean, the war ended in May. is that period of total chaos, total destruction. A vast city utterly destroyed. trying - those who'd survived - trying to get back on their feet. -To me, it's all on the back. As you say, there's this long text. I'm only going to read a bit of it. "and a woman well acquainted with all kind of fancy-work. "and the smouldering ruins of their beloved town? "barring the streets once full of life." You know, you can see it, can't you? And this is a chap called Kurt Panzer, strangely. bits of glass. And, obviously, they did a sequence of these. "Yes, we've got to bring this city back to life." -Do you think that's the story? -Yeah, that's what I like to think, yeah. -And was he a sensitive man? -So he'd have felt that he had to make a contribution? It wasn't just about making things to bring the city back to life. It was about earning a living. Presumably they sold these. -I hope you'll always treasure it. What's it worth? £10, £20, who cares? -But the story is amazing. of the aftermath of the Second World War. It's not just the valuable finds we remember. where Bunny Campione had a colourful start to her day. So, here we have a collection of bead bags. for the sort of woman who was going to a soiree, an evening do. She'd have it on her wrist, hanging there. And she would be asked to dance. She'd have her little dance card. "Lionel or George, at eight o'clock. Nine o'clock." a little bottle. And... before her dance. So she'd be dressed to the nines. Just imagine how romantic that is. And what a wonderful collection. Tell me, did you buy them or inherit them? she actually died at 29 in 1895. So then her daughter, my grandmother, carried them on. And I've got a book with both their handwritings in. And have you got a particular one that is very precious to you? Well, I used that one for my wedding 40 years ago. And I've taken them to quite a few nice dos. which were sort of dropped so some beau would pick them up. different colours that they used. -Probably your earliest one is this one. This comes from an etching or a print of 1820. Now, it could have been done later than 1820. It's poetic licence, if you like. they would have made this. It would have taken a very, very long time to make these. through a tiny, tiny bead. I mean, you just have to look. This is your biggest one. Which, I mean, just look at the work in that. It's just mind-boggling. Which, thank you, that's what we need. We need people to tell us when they made it. And I think most of them are German. carried on the collection a little bit and I've carried it on. -You've got lots more at home, you say? -About the same amount again. The large one, I think we're talking about possibly 300, 300-400. -We're talking about somewhere in the region of £4,000-£5,000 here. Got the same again at home? Similar. I brought the best. -OK. So, we're talking about 6,000 plus, yes? -There's going to be a fight, isn't there? But then you tell me there's a bit more of an interesting story. -come from King's College Chapel. whenever they did the refurbishment in the '60s. Sure. What were they catalogued as? asked them, were they're going to put them in the sale? so we waited until the end of the sale and bought them for £50. -which were designed for the building. King's College Chapel in Cambridge. for the Midland Grand Hotel in London. One of our best and most sought-after and revered architects. -And when his items come up for sale, they make a lot of money. -But they're not by him! They're actually by his son, I think. and fixtures for the chapel, for his father. in a haberdashery shop for displaying liberty bodices. Now, who remembers the liberty bodice? Let's remind ourselves, actually, what it looked like. looking very happy in her liberty bodice. Now, were your family in the haberdashery business? -No, not at all! No, not at all. -Oh, so what's the story here? I saw it, I fell in love with it, I did walk away from it! I went in and it was still for sale. So I thought, it's definitely mine! -It was meant to be! -Yeah, I just love it. -Pretty good. Pretty good, I'd say. this sort of remnant from a previous age of shop fittings. it was never meant to be beautiful and adorn some great country house. This is a working piece of equipment. I could see it easily fetching £250. the real thing for me is what it might smell like. I think I've broken it, sorry! -It is temperamental. It's old! shop in the village where I grew up. And, you know, it comes back straightaway. This is a well-loved teddy. -The story is, he was sent to me by my father. It was my sixth birthday, the 15th of June 1944. -With this little note here? wishing me a happy birthday. It says, "I wish I could come to your party. "Save Daddy a piece of cake. Much love from Daddy." his ship was torpedoed and it blew up and sunk within minutes. So this is the last communication I have from my father. And this little bear has been with me ever since. but I thought I'd bring him along today. This is a lovely, lovely Davenport. Do you have any history at all about it? Do you know anything? it came from my great-uncle. and Belgium, and we think that he bought it there. and to me it looks more like five years old! doesn't it? So that's something! Well, let me make you relax immediately. -It is a Victorian Davenport. -This dates to 1880, that sort of date. -Oh, that's what it is? and things like that. That is such a wonderful colour. -And, yes, it's kept its colour, hasn't it? -or several times a day. Sometimes they have drawers on the side. What's this got here? The quality here is amazing. This is by a top firm, I don't know who by. Mahogany inside. Oh, look, I can't resist this. Mahogany again. This was the fun. -Look at that. You know what that is? -Oh, that is nice, yes. Virtually only England ever did that sort of beading in the corner. -Of the top rank, really. It does look pretty new, but it's in quite good condition. One or two little bumps and scrapes, as you'd expect. to try and find one as good as this, £2,000. -I would have said £200! -I should have done, I should have asked you! a place where the finds just kept coming, as Philip Mould discovered. heightened with a bit of pencil. -From a local charity fair. So, the label on the back says two things. artists in the 20th century. And also, the name of the artist, a female painter, Mary Kessell. Yes, I think she's an important one. one of two female war artists in the Second World War. and produced some very arresting images. that the characterisation of this is done. in this instance, upon which to do their own work. Possibly an earlier drawing, or possibly the work of another artist. the figure in the background. It's almost two faces of the same person, perhaps. The rather soulful one, and the rather more open one. It's reflective, it's thoughtful, and it's a great buy for five quid! -I mean, she is an artist who I think will go a long way. -who knows? - one day an awful lot more. that this is not my strongest subject. and I want you to help me by telling me how they fit with you. of items that belonged to my great-aunt. Does the name Christopher Dresser mean anything to you? -OK. So, he was a doctor of botany, but also was a designer. "You make my designs and I'll take a design commission." Absolutely the way of the world today, but that was new then. was James Cooper and Sons of Glasgow. And these are the result. Two pieces of Clutha glass, this is the name of the range, Clutha. from the 1880s into the 1890s. another important designer of the period - designed from then on. especially unsigned pieces, Walton from Dresser. in your life are semi-kind of magical things in their own way. They are not worth a fortune. -makes you a happy gal. -So who was this gentleman to you? who was killed in the Battle of Isandlwana in 1879. -of the Natal military police. So, what we've got is the South African medal, 1877-79.
is the biggest disaster in British military history. Up to that moment in time. And it stayed that way until the 1st of July 1916 on the Somme. between 18,500 and 20,000 Zulu. And they killed 1,300 British soldiers, including your ancestor. This is a very nice medal. They very rarely come onto the market. -you can expect somewhere between £10,000-£12,000 for it. but it's got a very strong family connection, as you can appreciate. -No problem. You've made my day. so thanks very much for that. I wouldn't put those in there. They really are the most exquisite quality miniature pieces. to buy Lady Ironside's doll's house, because she was a collector. Hampton Court Palace, to the grace-and-favour apartments. That's a royal provenance, isn't it? and it was completed in 1924. -one of the greatest English architects. -you've seen it, I presume. Wow, you should go and see it and see the sister service. Yes, I've seen the book with it in, but that's all. ..written on the plate in gold. -Is it? I didn't know that. in absolutely minute lettering, it says "Made by Minton's limited." I did know it was made by Minton. but there are 18 plates - I'm sure that's the right number. with tiny individually modelled lids. but you've got platters, oval platters of various sizes. but there can't have been more than three or four sets made. and that's what you would expect from Queen Mary's doll's house. to provide this wonderful house. So it's an important thing. do you think that could have any real value? Can anyone give me a suggestion about what that might be worth? -But that was a fluke. -That was a fluke. That was a silly price. I'm going to ignore that £1,200. It's ridiculous, it's too high. It's been in a drawer ever since my mother died. I can hear my mother up there going, "Woohoo!" Been quite a year for Fergus Gambon, hasn't it? Remember those remarkable early English doll's he saw at Tewkesbury? And these miniature treasures just keep turning up for him. royal doll's house at Windsor. to see you at one of our shows. before you come are on our website. See you soon, I hope.